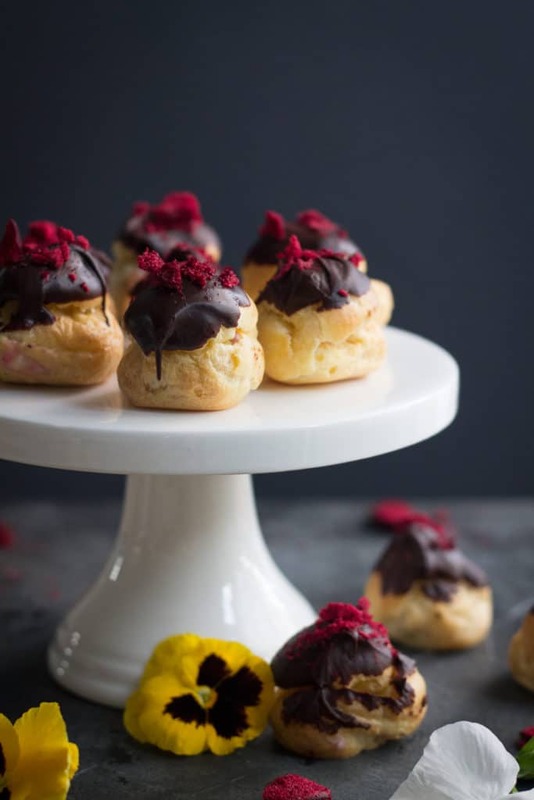 Rich dark chocolate, whipped cream, creamy plum custard and tangy lemon curd in a little dreamy choux pastry bite, could this possibly be the perfect little dessert? 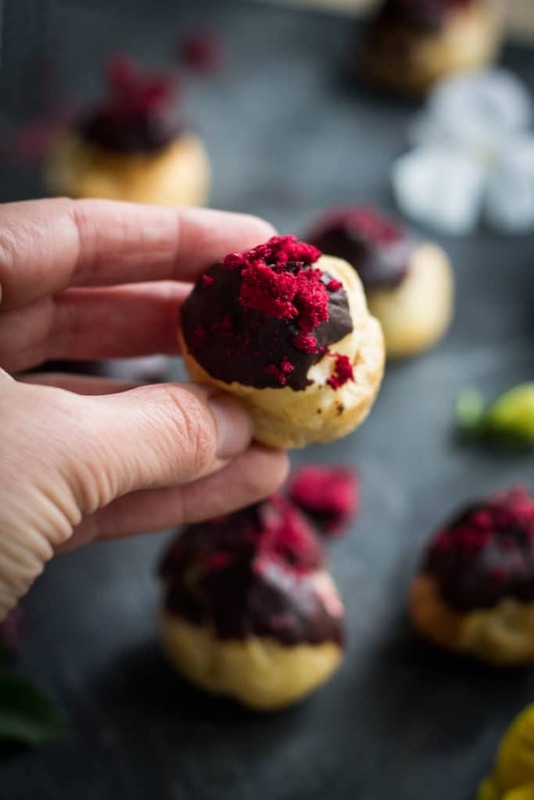 Hmmmmm….well regardless these little Plum, Lemon and Bittersweet Chocolate Choux Bombs are one seriously delicious treat. I have no idea who my ideal reader is or who I want to read my blog. To be honest I am just flattered that anyone other than my Mum and family stop by (who are obliged to visit all the time, yes you are obliged family, you have no excuses) and read what I have to say. Don’t get me started on someone actually making one of my dishes…well I think my heart skips a little beat I am so excited. Then a share on Instagram or Facebook? I have been known to faint! The ultimate though? I was at my friend’s party and someone came up to me and told me how much they liked my blog, well I felt like a freakin’ movie star! Jokes. Actually I felt so humbled that someone loved my blog that much and they were kind enough to tell me. If you’re reading, I’m so sorry I didn’t get to chat, I would have loved to…I’m a little shy. It’s currently sitting on my to-do list. 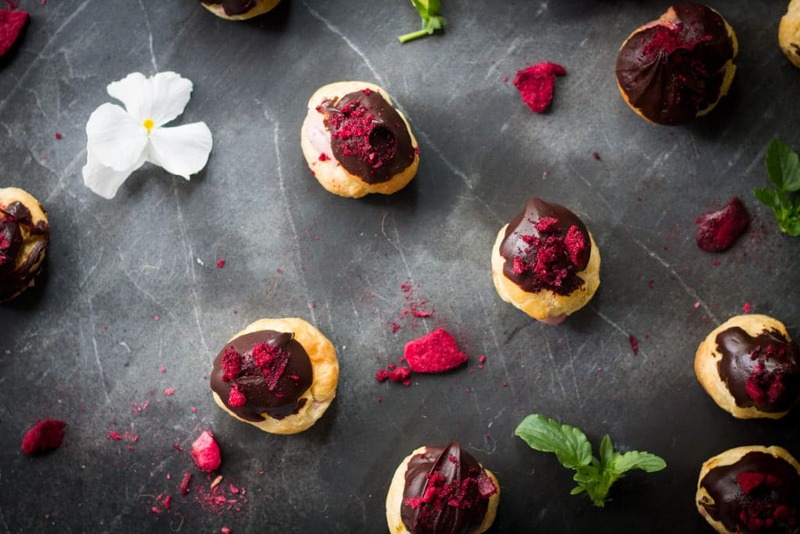 I don’t have an ideal reader, instead at the moment I just love to share the recipes I like to make and hope that you will love them too. No specific target in mind. I think my recipes fall into two main categories: (1) quick and easy, but super tasty weeknight meals or desserts, and (2) dishes, cakes or desserts that, when you have that super rare thing called ‘time’ in the weekend you want to spend a little more time in the kitchen enjoying making something special. This falls in the latter. 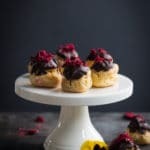 My Plum, Lemon and Bittersweet Chocolate Choux Bombs do have a few steps but I find it so enjoyable to spend a bit of time in the kitchen relaxing and creating these delicious treats – normally after the boys have gone to bed and I’ve drunken too much coffee that day! The filling is a delectable mix of creamy custard and whipped cream with tangy plums and lemon curd. 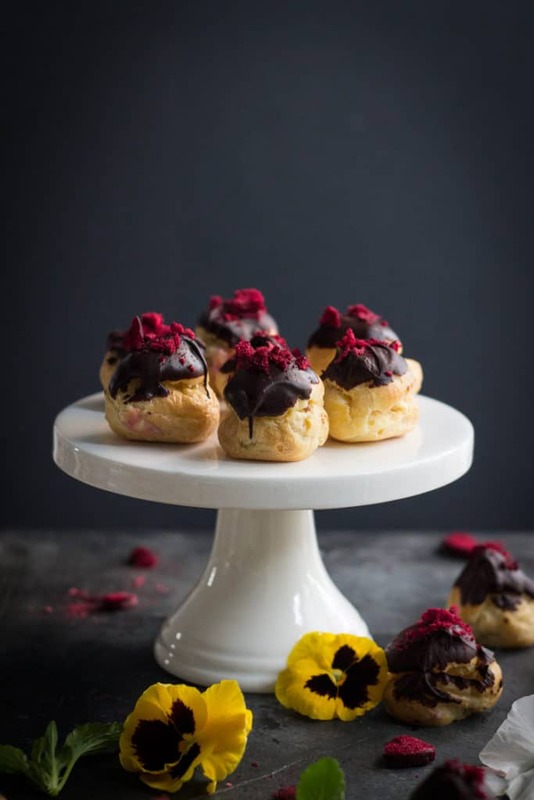 This is encased in a little cloud of choux pastry and topped off with dark and rich bittersweet chocolate and a little crumbling of dried plums for crunch. I think they are just the prettiest dessert but not too pretty that the boys in my family still love them too. 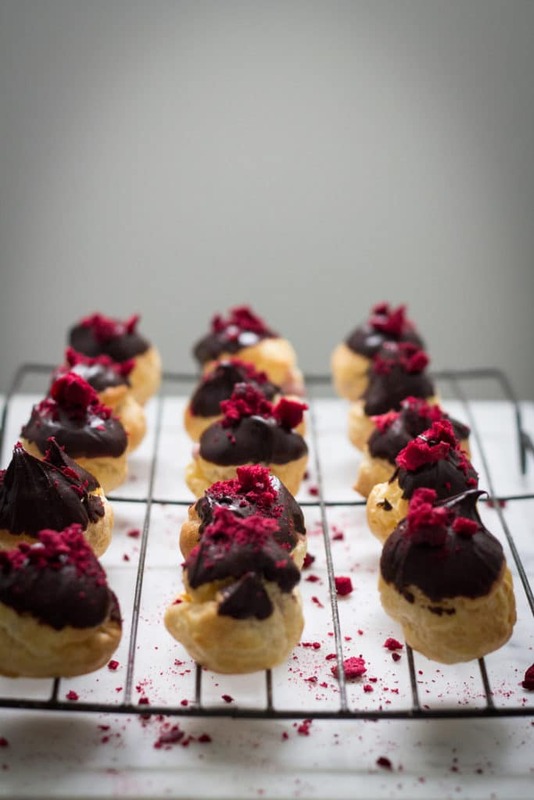 I do love to spend some time making these but if you’ve got the book club (or rugby team) coming over for drinks and nibbles and you need a dessert stat then these work just as well if you buy pre-made choux pastry bites and store bought custard. I hope you enjoy making these, and eating them of course…whoever you are! Preheat oven to 180C/355F on bake. Line a baking tray with parchment (see note 2) or a silicon sheet. Sift flour onto a piece of paper. Combine butter, milk and water in a medium saucepan. Bring to the boil over medium heat, stirring occasionally. As soon as the mixture reaches the boil, remove from heat and quickly, and all at once, add the flour. Immediately beat the flour into the mixture with a wooden spoon. Continue to beat for approximately 30 seconds until the mixture combines to form a soft dough and comes away from the sides of the pan. Either transfer to the bowl of a standing mixer or a regular medium size bowl (essential you transfer the mixture to a new bowl to help cool it down). Continue beating for 30 seconds to cool the mixture a little then add the eggs, one at a time, the until you have a thick, glossy paste. Transfer the paste to a piping bag fitted with a 1cm/1/2inch round nozzle (or ziplock bag with the end snipped off). Pipe 4cm/1.5inch rounds of dough onto the prepared baking tray. 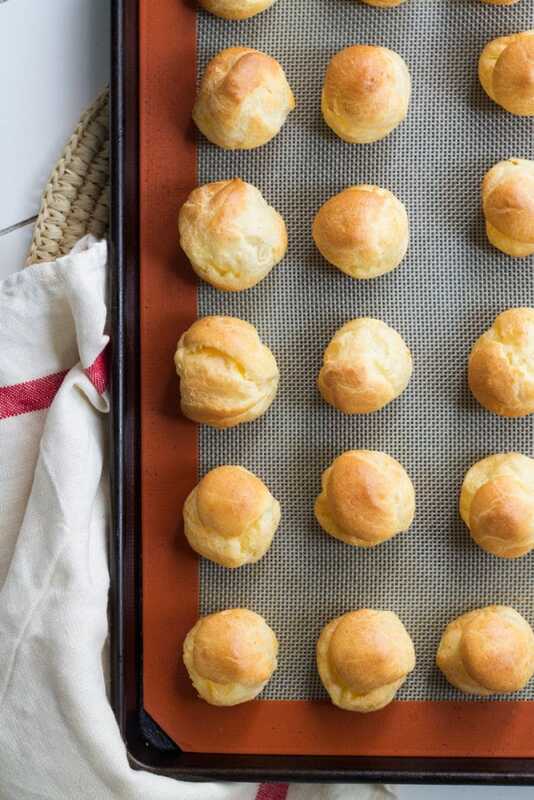 Once all the dough has been piped onto the baking tray, dip your finger in water and dab the top of each dough circle to make it smooth on top. Place on the top shelf of the oven for approximately 20 minutes or until the bombs are puffed up and pale golden. Turn off the oven and allow to cool in the oven with the door ajar for 10 minutes before removing from the oven to cool completely. 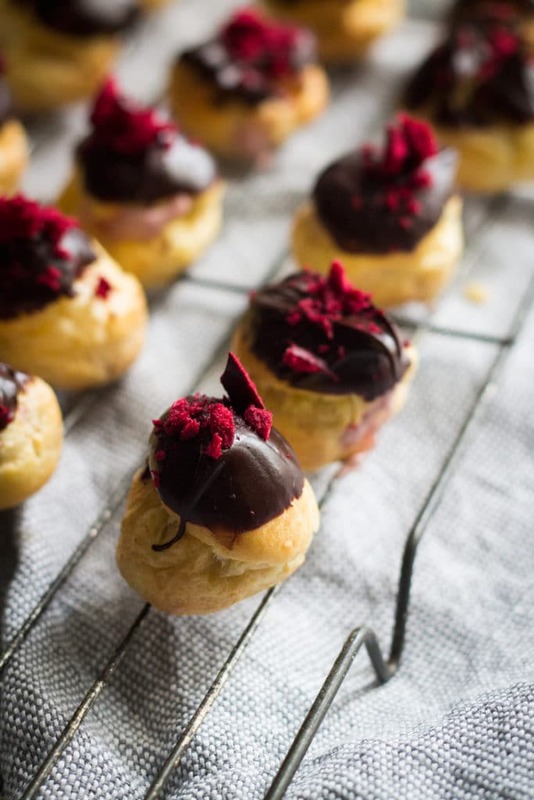 While the choux bombs are cooking, make the custard filling. Place the milk in a medium saucepan over medium to low heat. In a small bowl, using a hand whisk, whisk together the egg yolks, sugar and cornflour until creamy and turning pale yellow. Once bubbles are forming around the rim of the saucepan, remove the milk from the heat and add approximately one third of the milk to the egg mixture. Whisk until fully combined. Place the remaining milk back on the stove over medium-low heat and pour the egg-milk mixture back into the saucepan (see note 3). Continue stirring until the mixture thickens enough to coat the back of a spoon. In a medium bowl whip together the cream and plum powder. Fold through the cooled custard then transfer the mixture to a piping bag or zip lock bag. Place in the fridge until you’re ready to assemble. Mix together the lemon curd and lemon juice and put into a small piping bag or zip lock bag. Place in the fridge until you’re ready to assemble. Place chocolate in a heatproof bowl over a small saucepan of simmering water. Stir occasionally until the chocolate is fully melted. Remove from heat and whisk in the cream and butter until a thick, glossy glaze is formed. Snip off a very small corner of each of the piping bags filled with the custard and lemon curd mixtures. 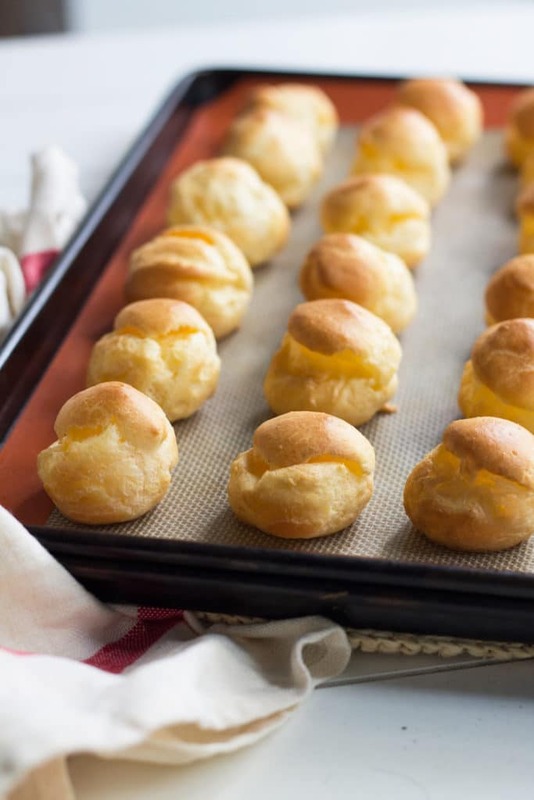 Take a choux bomb and pierce a small hole near the bottom using a sharp paring knife. Pipe in about 1/2 tsp of lemon curd to each bomb then fill with plum custard. 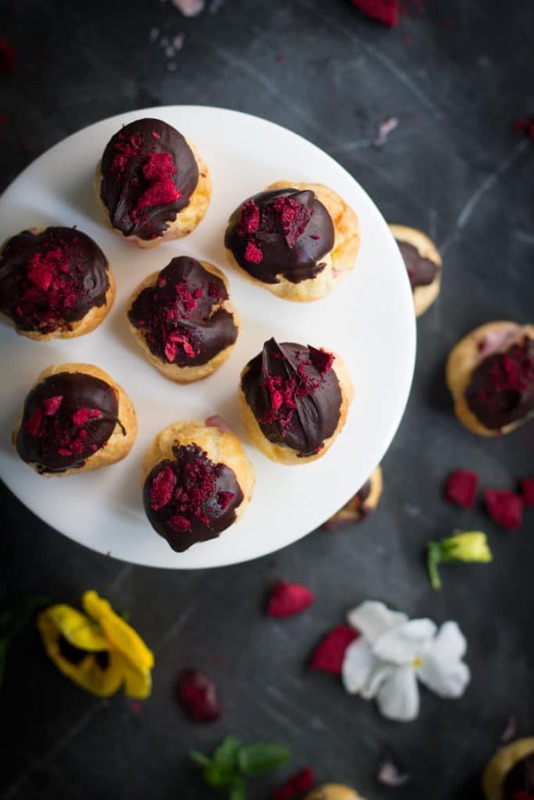 Dip the top of each bomb in the chocolate glaze and sprinkle over crumbled dried plum pieces (or sprinkle over a little dried plum powder). Best served on the day. 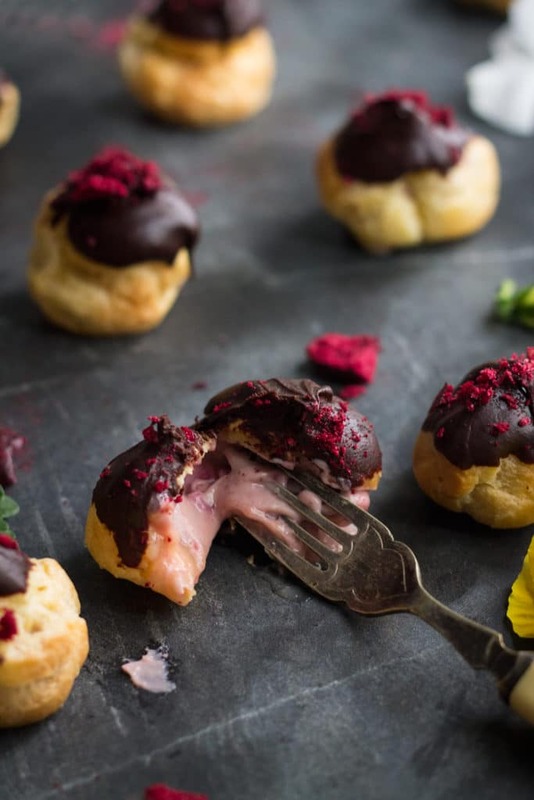 However, choux bombs and filling can be made in advance and stored separately in an airtight container and the fridge respectively for up to three days then assembled when required. Note 1. Freeze dried plum powder and pieces can be found at most gourmet supermarkets or online. Note 2. Remove the paper and run under cold water for a couple of seconds. Shake to remove excess water and place back on trays. This will provide more steam to assist in the profiteroles rising. Note 3. It is important to take this extra step when making custard otherwise if the eggs are added directly to the hot milk they will scramble. Thank you so much! Hope you like it.